Clients turn and seek out Coaches to improve and be more successful with many private and personal skills. A very vital element in the business world is “trust” its often a great first place for anyone to begin their transformation aspirations and endeavors as they begin their coaching journey. My reason for addressing that is there are formal coaching agreements that includes a contract once we begin our sessions together. There is confidentiality and non-disclosure which we both agree to in the contracting process. All that makes our sessions private and secure so your growth, development and goals are fully protected. You and I need to establish a firm “trust” in order to build a devoted partnership with each other. A wonderful book on this topic is The Speed of Trust: One Thing That Changes Everything by Steven M.R. Covey. Its a book for those that find that they could really reach people in their family, business or community more effectively. Its a resource for those that are driven to grow and establish a quality network of reliable and credible, units and teams. Please read this book, it will be very valuable for you, and provide you with wonderful strategies to apply to your life and your career. Its also designed for those that are successful, and aim to deliver consistent, positive results. His questionnaire is built and designed with questions into all those “Four Cores of Credibility.” When you take it, you rate yourself on a scale of 1-5. He has put together five specific questions in each core. At the end, you’ll come up with total scores within each of “The Four Cores of Credibility.” Those scores will essentially be a “snapshot” into where you are right now at this period of time, within a specific core. When you add up all your total core scores you see a full “snapshot” into where you are now, at this very time. You’ll learn about what you need to do to be more trustworthy. As you move through the wonderful book, The Speed of Trust: One Thing That Changes Everything, by Steven M.R. Covey, you will be able to deepen and expand your knowledge of “trust” and improve your knowledge of Covey’s “Four Cores of Credibility.” He will explain and breakdown the questionnaire and its content making the reading experience very interactive. First-hand, you will also start to make tremendous growth, establishing natural improved personal habits. Enjoy and embrace your journey into the application of the skills discussed in this book. I believe you will see a delivery of better “trust” results in your personal life. You may discover “trust” is a key component that has been a “blind-spot” for you and has held you back from achieving incredible goals, objectives, dreams and endeavors. 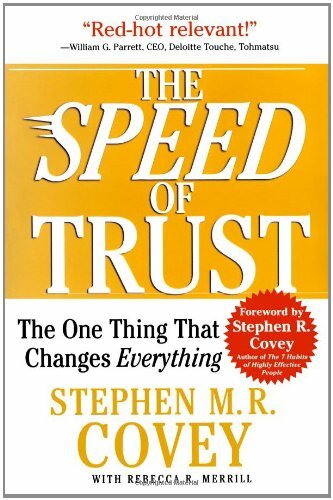 Personally, I found The Speed of Trust: One Thing That Changes Everything, by Steven M.R. Covey to be extremely valuable to my personal and private growth in both my professional and private life. I really found considerable value in what Covey’s Questionnaire results were. Learning those scores motivated me to learn more about what I need to do differently, and his book shared wonderful “real-life” examples of how to make direct improvements and have better results. Together we can use this book and Covey’s Questionnaire in our coaching sessions. For a free coaching consultation you can contact me here. If you would like to order a copy of your Covey’s book you can click on the image below. I wish you all the very best, thank you. Drive your team, courageously take ownership of your mission. Business is all about leadership. The individual leader is someone that all teams can embrace and trust for personal support. They drive every team and courageously take ownership of the mission. They are willing to teach values and collectively collaborate overcoming any obstacles towards winning. Clients come to coaching as leaders that are seeking clues to keep the team charging forward towards their ultimate goal. They come to a coach to grow and become more powerful. They come to a coach to grow and become more powerful. Leaders, embrace coaching to learn where their “blind-spots” may be and discover what strengths they can strategically leverage to maximize high performance. Courageously leaders are motivated for growth into the symbolic-embodiment of where they see the future, and seek to discover everything it takes to get to that zenith. I’d like break down my favorite quote and explain the fusion coaching plays with leadership development. Coaching offers the leader a safe and comfortable place to refine the critical skills in delivering, what Snair calls, that “positive reinforcement”. Coaching also teaches, the client the values, and strategies, in what Snair postulates is “relating the praise and reward back to the big picture”. When “the leader is the team” as Snair discusses, coaching provides a comfortable and confidential safety-net for the leader. Coaching also is a quality source for sustainability lessons for the leader, so the leader can flourish in their role as the “cheerleader” driving their mission towards winning results. This is just one snapshot of how the book provides wonderful actions into real-life business settings. 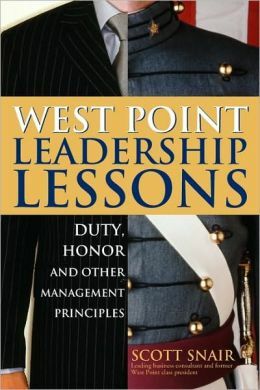 I know that anyone searching to rise up, and grow into a better leader, or take your career to the next level, would find great value reading West Point Leadership Lessons: Duty, Honor and other Management Principles by Scott Snair. I offer services to young adults searching to become better leaders or grow and discover the courage to move towards those goals and objectives. We explore and discover how to embrace fear, break out of your safety zone and courageously take that leading charge for your team. To set up a free coaching consultation, towards taking your career to the next level, please fill out my form here. To purchase a copy your copy of this wonderful book, please click on the image below. Wonderful strategies on job searching, successful interviewing and negotiating! Clients come to a Career Coach because they are looking for a resource to achieve higher performance, positive results and accomplish their goals, dreams and objectives. My company and provides young adults, 18-35 with a source to turn to when they are stuck in life, when they are noticing they have a ‘dead-end-job’ and have dreams of doing something else. My services are also a source for young adults to make career transitions out of their part-time employment and into a corporate position. It’s a place for young adults who may be in their dream career and are looking to get to that higher level and earning their promotion. I service the young adult community and assist them in designing actions that will help them accomplish and achieve all their goals. For a free coaching consultation, you can contact me here. You could also enjoy a wonderful book that will provide you with fantastic information and expanded knowledge, towards having a successful interview and landing your “dream job.” When you reach out to me I’d love to hear your accounts of the book, Your Career: What’s Next “The Job Seekers Step-by-step Handbook of Common Sense and Uncommon Strategies” by, Michael Mayher. It will certainly serve as a great resource as you strive to find your job and launch your career to higher levels. You’ll learn valuable ideas and strategies such as, how to build your “search plan.” Other great discussions and topics include interview skills, negotiating and overcoming not getting your job offer. These are all situations that many young adults experience as they pursuit their employment endeavors. I also provide a mock-interview package. The mock-interview package can be delivered in three ways by phone, Skype and a “one-on-one”, in-person. This way together, we could practice and apply everything you’ll read about in the book. To learn more about mock-interviews you can go here. For a free coaching consultation, or to set up your mock-interview you can go here. 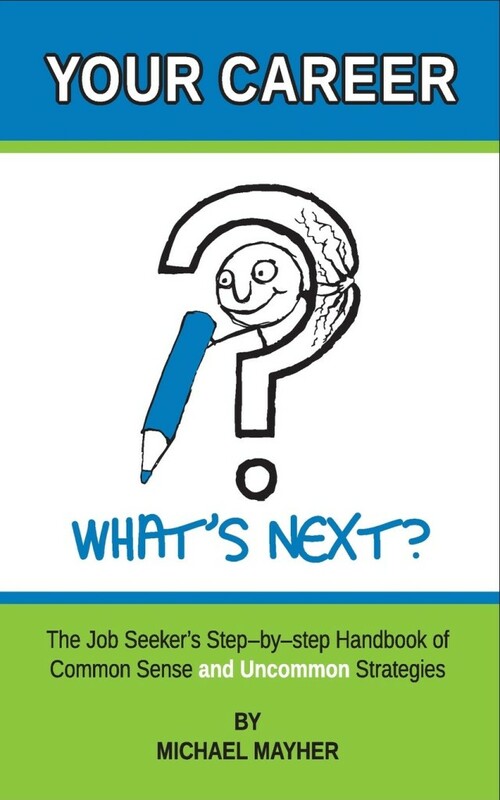 Please order your copy of the wonderful and valuable book Your Career: What’s Next “The Job Seekers Step-by-step Handbook of Common Sense and Uncommon Strategies” by Michael Mayher below. Here is a wonderful poetry book that embodies love, courage, overcoming obstacles, and adversity! Clients turn to Professional Coaches for motivation, courage, and determination. Clients come to a Professional Coach to overcome obstacles, setbacks and adversity. My suite of services is your resource. For more discovery and growth into these topics, I’d like to recommend a fabulous poetry book. It captures the essence of how motivation, courage and determination brought lasting love, prosperity and a zenith reward in life. It’s From Generation To … by Robert B. Fried. 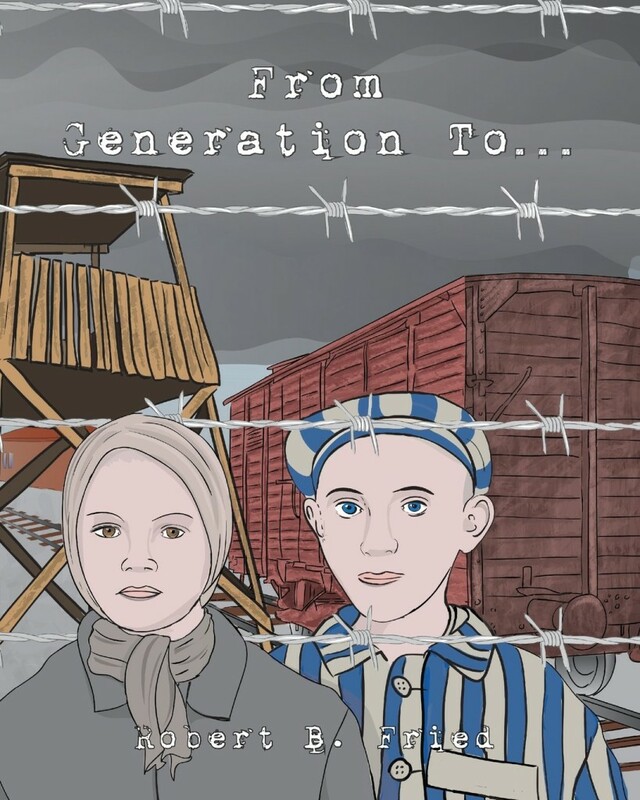 The book captures the complete essence of Robert’s four Grandparents and their courageous survival during the Holocaust. His Grandparents lives were caught off guard; they were driven from their homes by the Nazis and brought to live in Concentration Camps. Through the deep emotional literature, and the incredible visual illustrations, you are sympathetically captivated inside a completely courageous story and moving experience. Joshua: Thank you for taking time out of your busy schedule, to sit down with me today for this interview, I appreciate it. Robert B. Fried: You’re welcome, thanks for having me. Joshua: So, tell everyone a little bit about your inspiration, and motivation, capturing your Grandparents story and fusing it into moving poetic art, for your first published book. Robert B. Fried: This was a project that transformed over time. I originally wanted to put together a small pamphlet of poems that I had written on the Holocaust. My poems were written from stories told to me as a child. I would write poems throughout my childhood. As I put together the pamphlet the project grew based on other information that I compiled over the years. Such as, documents and things that were equally important to share with everybody. As this pamphlet grew, I engaged an Illustrator in the UK, Sam Wall, to help bring my poems to life visually. There were a lot of inspirations and self-perseverance to keep going with the project. I had support from my paternal grandmother who is still alive, support from my fiancé, my family and friends. It was a overall great effort and I am really proud of it today. Joshua: What legacy and message from your Grandparents story would you like to leave behind? Robert B. Fried: The legacy I’d like to leave behind with From Generation To … is my Grandparent’s stories, bringing them to life both in poetry which I wrote as a child and in in the collaboration with the Illustrator. I thought the poems stood well on their own. However, I wanted to make sure the reader was going to be moved by not only my words but also what I had put together with the Illustrator. Vividly I wanted to show that the scenery or events I was describing were accurately merged together. Joshua: Is there anything else? Robert B. Fried: Yes, with this book I’d like to leave a legacy that I helped people understand and educate them about this time period in history. A time-period we should never forget. That we should always respect others, their race, religion, creed and appreciate that we share this world together. We should live together in peace and should never see and experience the atrocities like my Grandparents and others experienced in the 1930’s and 40’s. Passing on my Grandparent’s stories from generation, to generation is very important. Joshua: You chose a unique title for your book From Generation To … could you explain the meaning behind that? Robert B. Fried: “From Generation To …” comes from the Jewish prayer “L’ Dor VaDor” and when the prayer is translated to English from Hebrew it means “generation to generation”. Passing on my Grandparent’s stories from generation, to generation is the importance of the overall project. Joshua: Thank you for sharing your experience of not only the courage and determination to finish this wonderful project and turning it into literary art, but capturing your Grandparents stories of courage, determination for everyone to embrace and experience Robert. Robert B. Fried: You’re welcome. Clients come to a coach when they are looking to rebuild, rebrand and positively move towards a brighter future. Clients turn to coaching to find a more fulfilled life full of happiness and love. They want to achieve all their goals, dreams and endeavors. For free coaching consultation, you could reach me here. I absolutely recommend that you purchase Robert B. Fried’s book, thank you Please visit Robert’s website at: www.fromgenerationto.com You can make your purchase of this wonderful book below. The inner-dynamics of Organizations, Corporations and Teams! For young adult clients to have more successful, sustainable and empowering careers, the young adults need to have a solid understanding of what dynamically makes an organization, corporation, and team achieve maximum results. 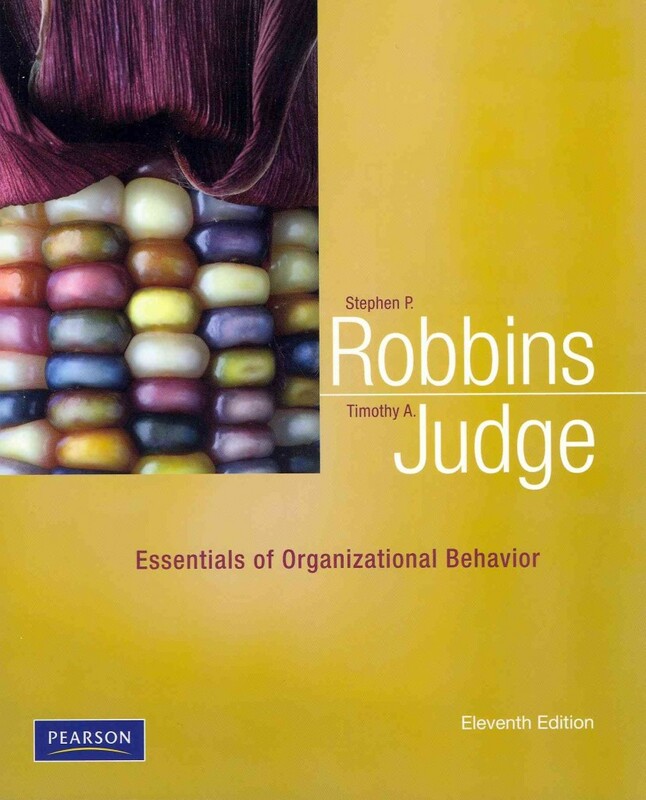 The 11th Edition, Essentials Of Organizational Behavior by Stephen P. Robbins and Timothy A. Judge is quite the reference guide for all involved in the process. Each chapter has incredible detail and is clearly organized to give the reader not just a better understanding of the topics in discussion, but give the reader a valuable resource to have at their figure tips. As you read through all the topics you’ll envision your own “real-life” situations. Having worked for two large Media Corporations, for the past 13 years, I was able to have many of my questions and clues answered and discovered. In my own JALCoaching.com Blog Posting, “As a manager are you embracing a healthy coaching culture and utilizing the strengths and skills of your HR, Business Partner?” Briefly, I provided provocative thoughts and concepts on this topic and question. Today there questions which still remain. These questions go out to the young adult manager: Are you embracing a healthy coaching culture? Are you really valuing the suite of skills your HR, Business Partner brings to your team? Do you know enough of the topics to collaborate and get the maximum results out of your team? If you feel that you may need more insightful information to the inner-dynamics of Organizations, Corporations and Teams you may find The 11th Edition, Essentials Of Organizational Behavior by Stephen P. Robbins and Timothy A. Judge is as valuable a resource for you as it was for me. Reading this book was a tremendous experience for me . I have expanded my all my knowledge, fine-tuned my approaches to learning and development, plus I now have answers to questions and clues to engaging and delivering successful results for my teams. I strongly encourage young adult employees and managers reach out to my suite of services to get the full and complete experience. Together we’ll partner, to build and grow your skills, and fuse them towards goals of getting the highest-level performance out of your team. The 11th Edition, Essentials Of Organizational Behavior by Stephen P. Robbins and Timothy A. Judge will serve as our content. By working together, you and I will accomplish your goals, dreams and endeavors towards a wonderful and successful career. For a free coaching consultation, you can reach me here. You can order your copy of this outstanding book below. Discover “A Whole New Mind”! Personal success and fulfillment requires discovery and takes a lot of courage. Your brand is a very delicate and to ensure you’re on the right path, you need to strategically define and determine the next course of action. The best place you can turn is to reach out to me for coaching. Another resources for your quest towards opening up your mind to new ideas, dreams and goals I recommend starting with the book, A Whole New Mind: Why Right-Brainers Will Rule the Future , by Daniel Pink. This book is written in stages, and as you move from the beginning chapter, “Right Brain Rising,” to his final chapter, “Meaning,” you’ll be truly captivated. You’ll be immersed, in the enjoyable discoveries, and self-discoveries, that make improving and re-branding, not just an idea, but a clearly defined vision. Pink’s book helps you really, fine-tune the right path and aim for your next journey in life. I came across this book at the right time in my life. A year ago, I chose to embark on my Graduate School ambitions, at the University of Texas at Dallas. Within the Organizational Behavior and Executive Coaching Program, I found this book among my reading list. The timing of being in the University, fused with reading the book for class was truly an uplifting and rejuvenating experience for me. Together they both provided a valuable safety net as I planned to move toward a bright and successful future. As I continued reading Pink’s, A Whole New Mind: Why Right-Brainers Will Rule the Future , I discovered new my new ambitions and career goals. I learned about many great tools to get myself reorganized and re-positioned, to set out into my next chapter in life. I really enjoy how Pink fused music, art and technology into this fantastic novel. Pink drives home the message that understanding those components are the keys to establishing a successful career as we live and work in the “new millennium.” I now have better understanding of how technology and automation changed the scope of my personal life and what I experienced during my career. Daniel Pink has a whole chapter called “Abundance, Asia and Automation” it was there where I vividly saw many parallels to my experiences. 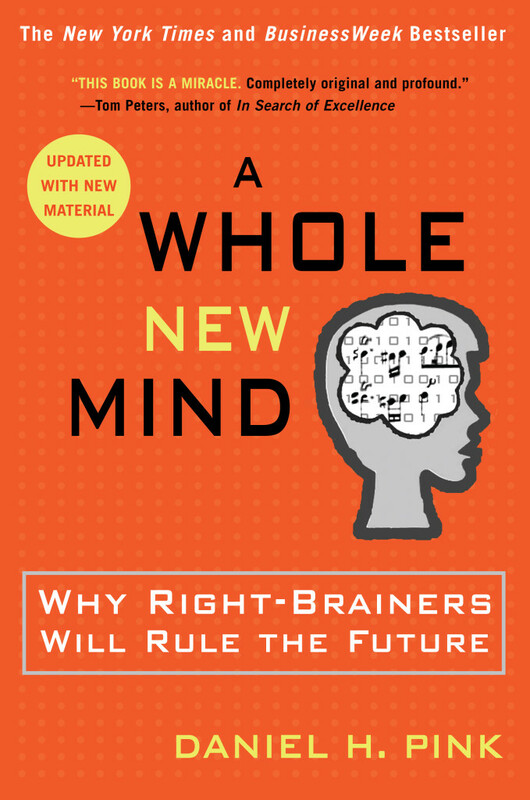 Personal re-branding should start with A Whole New Mind: Why Right-Brainers Will Rule the Future , by Daniel Pink. It enables you to unwind, relax and retool your energy into your next idea, goal, ambition and endeavor. I recommend going out and discovering fresh, wonderful, ideas. If you would like to reach out to me for coaching you can reach me here. Do you need that “good-ol” Football Coach to motivate you to win? Building and growing your self-confidence, your determination, your motivation and your drive to be more successful are all wonderful reasons to reach out to me for coaching. You can contact me here. There are many times where you also just need that quick access quote to motivate you, inspire you, and drive you to toward accomplishing your goals, objectives and endeavors. 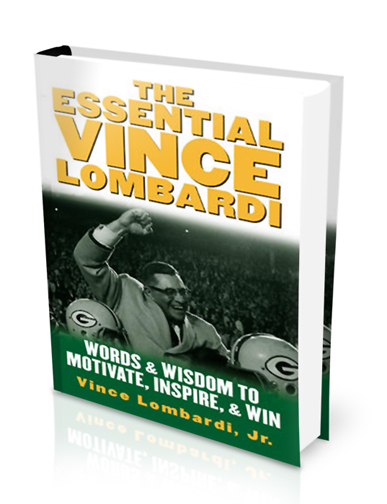 The Essential Vince Lombardi : Words & Wisdom to Motivate, Inspire, and Win by Vince Lombardi, Jr. is an outstanding collection of Lombardi’s notes, speeches and quotes. This special book serves as a “go-to” resource for your speeches, meetings, lectures and presentations. I recommend it to help you find some outstanding Lombardi quotes to assist motivating and inspiring everyone in your community. Vince Lombardi, Jr., put a lot of love into the book. He captured his father’s story, and his father’s legacy the way the Lombardi family would like Vince Lombardi to be honored, embraced, and treasured. It is wonderful to learn about this American Icon from the perspectives of his family; Lombardi’s own notes; and from family friends. So if you’re looking for that extra attraction for your next speech; that extra wisdom to inspire your troops, team, or employees; go out and get this book and recite a quote. If you are looking to tap into your “inner-burn”, drive, motivation, or that quick “pick-me-up”, this book is a very valuable addition to have nearby. I hope you enjoy it and find it as wonderful as I do. To build and grow your self-confidence, your determination, your motivation and your drive to be more successful you can reach out to me for coaching here. Are looking for that higher-level edge and discovering clues to becoming more successful? Consistent high performance occurs with your assignments when you have the necessary flow and when you are performing your task successfully with quality involuntary responses. However, when you need to refocus after change has occurred, or when you have to change your attention to resolve an issue, how quickly can you bring your self back to that relaxed and involuntary state? How successful are you? If you would like to improve on those scenarios you can reach me for coaching here. 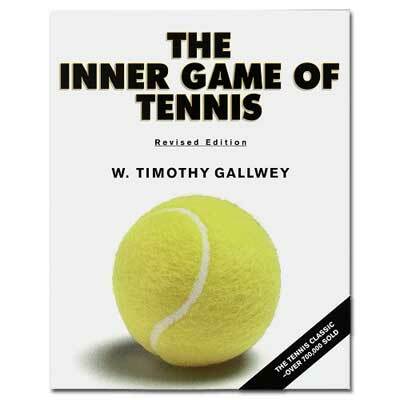 You can read this wonderful book by W. Timothy Gallwey, The Inner Game of Tennis. I found this book when I was working at a large media corporation 10 years ago. I received a lateral promotion that expanded the technical scope of my daily assignments and responsibilities. I was Master Control Operator, operating three of my corporation’s largest Television Networks. I was highly dedicated and motivated to collaborate and find solutions to every technical challenge I faced with my exceptional, technical team. To keep my focus and my performance level on the right-track to success, I searched for some clues and resources. I was searching and exploring being able to apply and fuse better habits and methods into my overall contribution to my team’s daily output for our Network Operation Center. The fantastic book during that exploration process was The Inner Game of Tennis by W. Timothy Gallwey. I personally found it has the right answers you desire, when you wish to achieve high-level performance in whatever you do. This book is almost like a bible for every professional tennis player these days. When I was working for another large media corporation, which televised all of the Four Men’s and Women’s Tennis Majors, occasionally, I would hear players during their interviews, and during their Press Conferences, mentioning The Inner Game of Tennis by W. Timothy Gallwey. This validated all my thoughts and perspectives, hearing them describe how great this book is, as a resource for inspiration, motivation and focus. As a Career Coach, I recommend this book for the mind-body connection; relaxed concentration techniques; the focus of your mind to overcome nervousness and self-doubt; and building skills for high levels of performance. These are very valuable approaches to your performance. They are not just for those looking to succeed on the Tennis Court, but those looking to get answers how to get from “Point A to Point B” or to “fine-tune” your “on-the-job-performance”. This book will guide you towards the right path to achieving your career goals and objectives. So if you are looking for that “higher-level-edge” and discovering clues to becoming more successful, I recommend that you get a copy of The Inner Game of Tennis by, W. Timothy Gallwey. After reading this wonderful book, you would like to work on applying all these insightful techniques, please contact me for coaching here. Build your confidence, maximize your performance and improve your results! How competitive are you? Are you seeking an edge to perform better and achieve improved results? One service that I work with clients to perfect is “theater-of-the-mind” techniques as a way to overcome performance dips. Visualization could also be used for seeing the future, relaxing the mind and zeroing in on defined goals. If you would like to work on all those things an more to improve your performance and maximize your results please contact me here. If you’d like to enjoy some reading on this topic, I’d like to recommend a fantastic book that provides those mental training skills and techniques used by elite athletes. My challenge to you is to take your daily routines and tasks at your job and fuse them to the training methods discussed in Mental Training for Peak Performance: Top Athletes Reveal the Mind Exercises They Use to Excel , by Steven Ungerleider, PHD. I turned to this book in 2006 after I left my position at a large media corporation; and accepted a similar position at another large media corporation. I was leaving behind working in a a fully automated Network Operations Facility and joining, another Facility that was in transition to be fully automated, themselves. I had very little experience working in a manual Master Control environment. However, professionally, I was highly driven and self-motivated to learn how to perform and succeed in my new role. I love challenges and thrive on challenges. Therefore, I realized rather quickly I needed to latch on to some mental training skills and techniques to make a smoother transition and upgrade my performance. I found this book in my search for clues and answers. I really found it to be a very quality read. Over a two year span after applying these skills my performance was upgraded and I experienced continued success through my team’s transition out of a “Manual Era” and into their “Automated Journey” into their future as a facility. Chapters 1 -10 really serve as your quest and guide into curiosity, discovery and a fulfilled journey. You will see progress as you apply the skills through each chapter. I really feel you will find the read to be uplifting, empowering, you will have flourished self-confidence and new tools to enhance your performance and results. 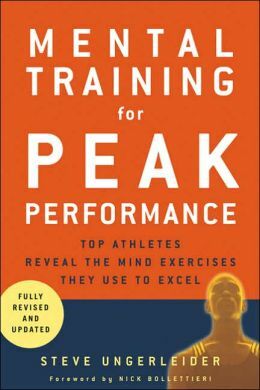 So, take my challenge, and take your daily routines and tasks at your job and fuse them with the training methods discussed in Mental Training for Peak Performance: Top Athletes Reveal The Mind Exercises They Use To Excel by Steven Ungerleider, PHD. To further expand on your reading and apply these skills you can contact me for coaching here.